Our boxing and kickboxing trainers teach you how to FIGHT. How to punch, kick, duck, take a hit, and get out of the way - FAST. It's intense, it's fun, it's exhiliarating - and it's not for sissies. Not only will you learn technique and form, but part of each session is dedicated to strength and conditioning so that the next time your hit lands, it's more accurate, more precise and more devastating than the last. 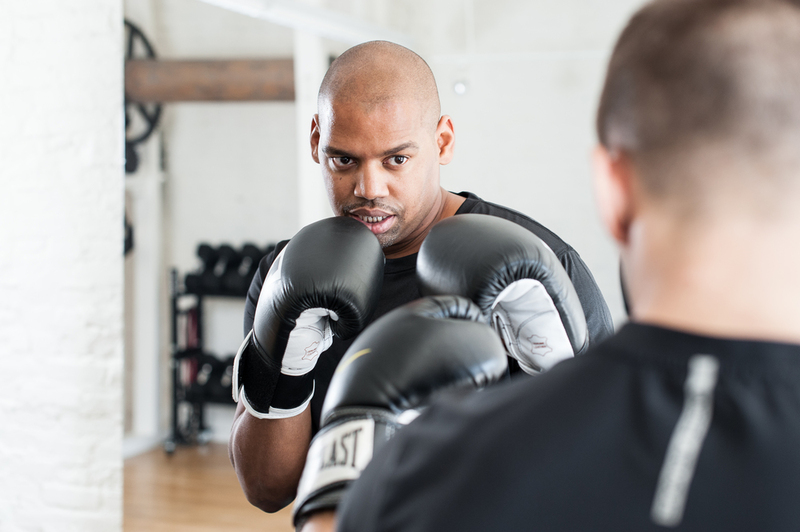 Much of your session will be sparring with your trainer, punching and/or kicking clearly marked moving targets - your trainer is your workout. Some of your session will be geared towards increasing stamina and strength and can involve the following pieces of equipment: Rogue Concept-2 Rower, jump-rope, heavy bag and double end bag, as well as other tools found on our third floor space like the Vipr Tubes, mats, tubes, balls, thumper, and more. No matter what happens, you will leave the session energized - and feeling like a badass. Because sometimes it just feels good to hit something. Do you have kids at home with energy to burn? Would you like to see your son or daughter quiet from exhaustion? We can help! One of our trainers specializes in training kids and adolescents. As a former kid with a little more energy than his mom could handle, Pat was sent to the boxing gym everyday as a youth. There he learned discipline, endurance, body awareness, spatial awareness and a skill he uses to this very day - boxing. Most of our kid clients do private sessions, some pair up with friends for duets and trios, others train with their mom or dad - which is a great way to do something as a family that is both healthy and fun. Fun fact: our youngest boxer to date is 6 years old and duets with his older brother.